Hard red winter wheat in south central Kansas, southwest Kansas and western Oklahoma could see a 17% drop in yield this year providing rain arrives soon to prevent further deterioration of the drought-ravaged crop, according to crop scouts on Wednesday’s leg of a wheat tour. Yield estimates gathered from 271 field surveys on Wednesday averaged 30.8 bushels per acre, down from the tour’s 37.1 bpa estimate for that area a year ago. Most of the decrease this year was attributed to drought rather than a mid-April freeze. “It was pretty bleak,” Tyler Harris, a tour participant and regional field editor for Farm Progress, said of the wheat. “The general consensus is that freeze isn’t the concern, the drought is. 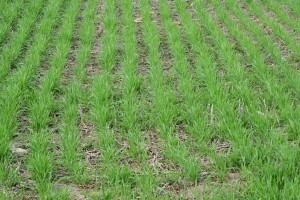 Some of the wheat had headed but was so short, some 10 to 15 inches tall, that crop scouts said it may be difficult to harvest. “Moisture is needed soon to preserve what yield potential that is there,” said Harris. Kansas is the nation’s largest wheat producer and harvested 319.2 million bushels in 2013 with an average yield of 38 bushels per acre. The tour concludes in Kansas City, Missouri, on Thursday in which the scouts will compile yield estimates and provide an overview of the crop.